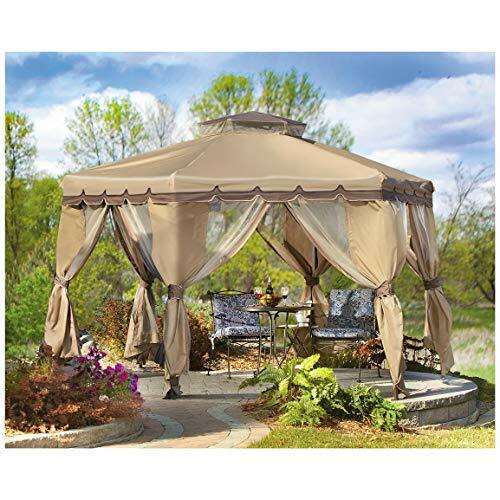 The Kingpin was chillin’ out in the backyard the other week when he thought of a great post idea for the site–it was about one of the more underrated canopy family members, the revered gazebo canopy. Need the perfect centerpiece for your empty backyard area? Or how about a wonderful place to entertain guests or set your drinks and towels aside at the poolside? A gazebo canopy is the perfect fit for all of these situations and will bring a certain style to any home. Most designs are portable as well and are a perfect fit for a classy tailgate gathering with the boss or your next party with the in-laws. As springtime comes to an end and makes way for another hot and heavy global-warmed summer, the Kingpin thought it was only apt to blow out this EPIC gazebo canopy list for you all in the process! Check out all these beautiful gazebo canopy designs, any of which would be great additions to your home. Let’s begin! Last update on 2019-04-26 at 06:17 Product prices and availability are accurate as of the date/time indicated and are subject to change. Any price and availability information displayed on [relevant Amazon Site(s), as applicable] at the time of purchase will apply to the purchase of this product. This ﻿﻿12 foot gazebo canopy offering from Castlecree﻿﻿k is literally shaded paradise. It has a royal characteristic and sets up in minutes for portable shade and shelter for you and your family. It can protect you from sudden rain showers and will easily set up with it’s steel-accordion design. The fine mesh netting protects against bugs and insects and ties back into place, nice and neat. The central roof mesh allows extra ventilation on super hot days and it even comes with a travel pack to boot–a great way to start the list! Sunjoy’s gazebo canopy offers a less portable option but makes it up with some extra durability and storage as well. The has a steel powder-coated frame that will give you several years of protection from rust, corrosion and the like, and features corner shelves for extra storage! The Kingpin is also thinking that these would be perfect for decorative planters. It also features a double center roof for extra ventilation. 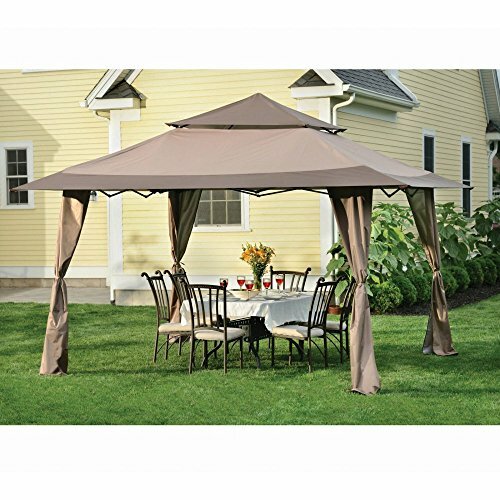 Essential Garden offers a very similar package to our first Castlecreek gazebo canopy. It comes with mosquito netting and no double roof ventilation, unfortunately, but is also a beautiful specimen to say the least. It also comes with a packing bag and will be perfect for soccer games, staff or family picnics and more. OK now this is innovation! The Kingpin loved this design right off the bat because of the last Canopy Kingpin list on retractable awnings. This stunning Castlecreek offering is the perfect gazebo/awning lovechild! The powder-coated steel provides longevity against the elements and this is an expected design move since this particular model will not be as portable as some of the others on this list. The awning even lowers into a half-wall position for extra privacy from any nosy neighbors. Perfect for your backyard this summer! This Gazebo Laketon offering provides the same powder-coated steel durability as our Sunjoy model but also provides a mosquito net for insect protection outdoors. It even has the same corner shelf spaces for your planters. It may be a little out of range for some budgets but you get some peace of mind from all the bugs in exchange. Though these models are much sturdier than the more portable gazebo canopy designs on this list, the Kingpin would advise caution in strong storms and terrible weather. Protect yourself AND your canopies! Be smart and take them down if needed. This next gazebo canopy offering from ShelterLogic features portable customization in a pretty package! The Royal Pavilion is constructed from powder-coated square tube steel so as not to sacrifice stability. The decorative double roof offers extra air passage under the canopy and the match cover ties back against the frame to keep away nicely. One of the Kingpin’s favorite features is the 3-position adjustable leg height! Great for customizing your shade and comfort. This thing is big by the way–13×13 is plenty of space at such an affordable price. 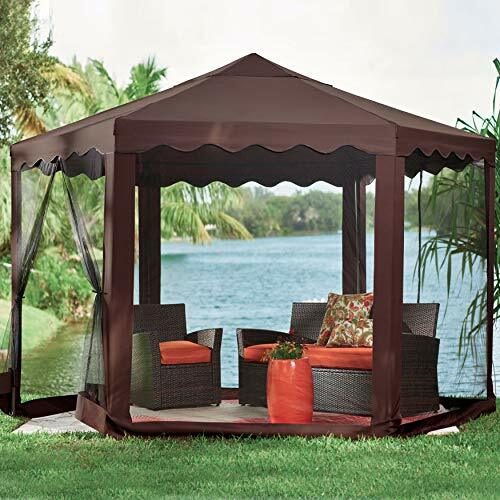 This model from E-Z Up features the same huge coverage as our last gazebo canopy and adds water and fire resistant 250-denier polyester fabric to the make for durability. 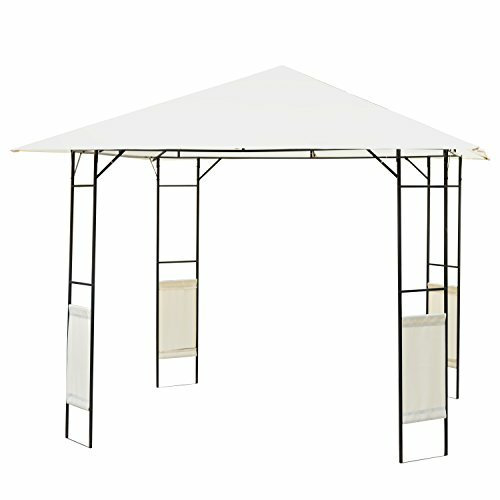 It’s easy to set up and portable as well and looks great with its two-tone canopy color design and matching leg skirts. Another affordable 13×13 option! 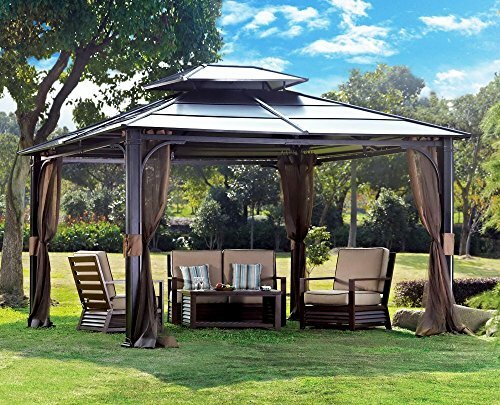 OK, your average entry-level gazebo canopy will probably cost you a pretty penny and may be a bit too rich for some blood out there. As such, the Kingpin has picked this particular entry for it’s relative affordability and this will give you gazebo canopy coverage without breaking the bank! O﻿utsunny’s 10×10 gazebo canopy on the cheap features a durable steel frame adorned with a water-resistant canopy top. Fastened with Velcro straps, the canopy also features small holes to prevent water from pooling on the roof. Some simple assembly may be required but it’s lightweight and easy to move around and really is a great deal for the money. By the way, the Kingpin thinks it’s safe to assume that this particular gazebo canopy is not meant for strong weather! LEAVE IT UP AT YOUR OWN RISK! 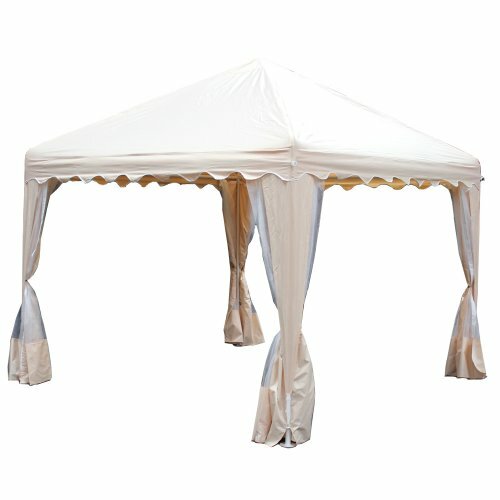 Brylanehome’s new and improved hexagon gazebo canopy actually reminds me of some of the party tents the Kingpin featured on this site! This model features plenty of space for lawn or patio furniture and also comes with a mosquito net for removable protection from bugs and insects. The super fine nylon net covers adorn all 6 sides of the gazebo and also includes stakes for fastening into the ground for extra stability. The brown PVC coated polyester canopy will give you all the shelter you need without breaking the bank. 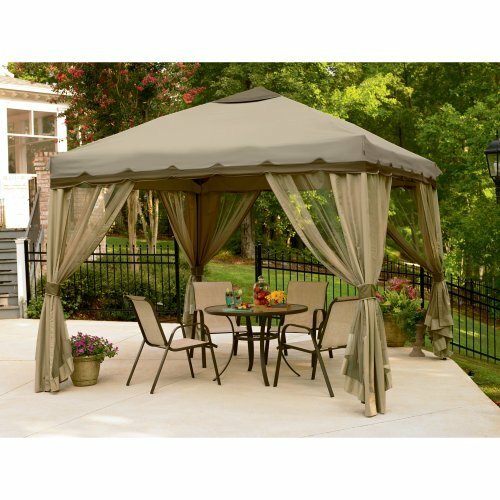 The Kingpin believes that this gazebo canopy is easily one of the better values on this list. Also borrowing a bit from the pop up party tent vibe, this King Cano﻿py gazebo canopy will easily catch anyone’s eye. It will proudly stand out in any setting with the Spanish red hue! 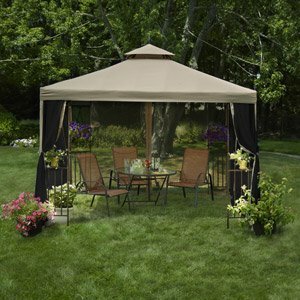 The canopy is made from almond polyester and features zip-up bug protection for your backyard. It’s UV and water resistant and made with fire retardant material, just in case there are any huge picnic fails coming up at the next family reunion. Get away from the grill, uncle Butch! The Kingpin implores you to check this one out, as it is very highly-rated with plenty of positive reviews. OK sometimes on an EPIC list like this, you have to separate the MEN from the BOYS. 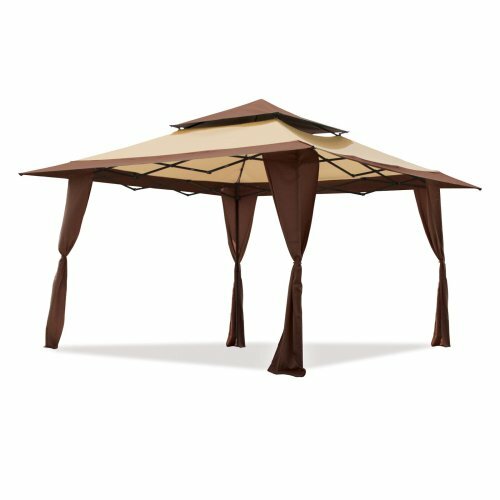 These last few models are meant for those of you who are frickin’ SERIOUS about bagging an awesome gazebo canopy. This beautiful gazebo canopy from STC will quickly become your new favorite spot. Constructed with powder-coated, heavy-gauge extruded aluminum, the gazebo frame is adorned with coffee-bean wicker wrap to complete the vibe. 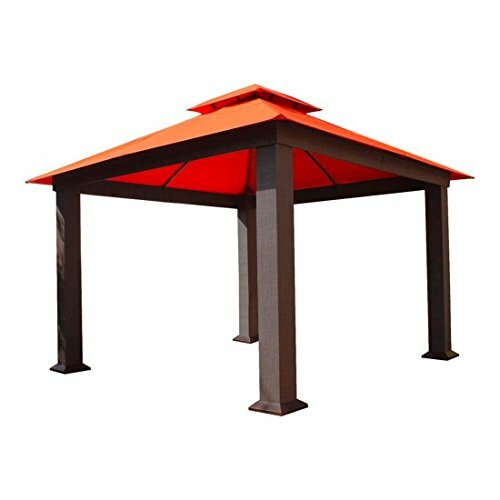 The 12×12 canopy is sun-filtering and fade-resistant and sports a stunning Tuscan orange hue. The double roof vent provides that extra ventilation as well. This beauty assembles in 2-3 hours with 1 or 2 people working on it and will last for years to come. You are certainly paying for quality at this price point and the manufacturer offers several years of warranty coverage on both the frame and canopy. The frame on this 10×12 offering from Chatham features full metal construction and a steel roof to boot. 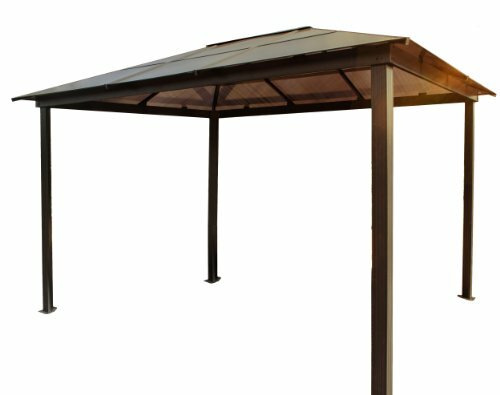 After you spend some time bolting this thing down, no other gazebo canopy on this list can match its stability. Everything is powder-coated and protected from the elements and chipping and it also includes mosquito netting to boot. The Kingpin also believes that this model has the best-looking double roof design of this whole list. This item may possibly ship with a freight carrier. So you better plan to be present at the time of delivery! Last on the list is yet another awesome offering from STC (They really know themselves a gazebo canopy, don’t they?). This beast features an all-weather polycarbonate canopy roof supported by a heavy-gauge extruded aluminum frame; powder-coated as well, of course. At 10×13, this gazebo canopy boss provides over 130 square feet of high-quality canopy coverage and you won’t ever regret the extra money spent on quality. The Madrid gazebo will elevate your property appeal for years to come and will probably last longer than that. The Kingpin thinks the image above speaks for itself: these last few gazebo canopy models are frickin’ SERIOUS. Grownups can’t have all the fun. 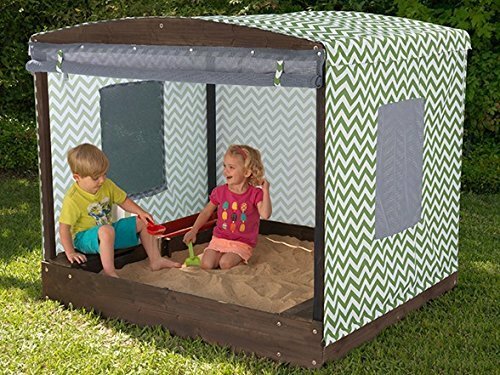 This cute little KidKraft Fun in the Sun Cabana Sandbox is a little bit of shade for your little darlings. It comes with 3 storage bins for all their shovels and toys and also features roll down mesh coverage for insect protection, like many of the gazebo canopy models on this list. Well, it’s not exactly a gazebo canopy, per se, but even junior needs to get out of the sun every now and then, right? Anyone of these gazebo canopies would be great for your home. Check them out again and take a pick, click on the image and find out more. It won’t hurt to read the reviews and get a better idea either, but whatever you choose, you can be sure to enjoy some stylish shade and coverage in the comfort soon enough! Come on in, out of the sun! Keep your cool with Canopy Kingpin today!